The Larson Electronics SPLED-QP-1X10WRE Quadpod Mounted Solar Powered LED Light is an ideal portable lighting solution for remote areas and temporary standalone applications where connection to external power is either impractical or unavailable. This rechargeable solar powered LED light is offered in a spotlight or floodlight beam pattern and several different operating configurations, making it ideal for remote applications. The portable quadpod mount makes the SPLED-QP-1X10WRE simply to move around work areas and folds up for even more portability and for storage options. This solar powered LED quadpod light is offered in several different configurations and powered by one 8aH sealed lead acid battery that is recharged by a 30 watt solar panel. Light output comes from a 10 watt LED lamp that produces 860 lumens. 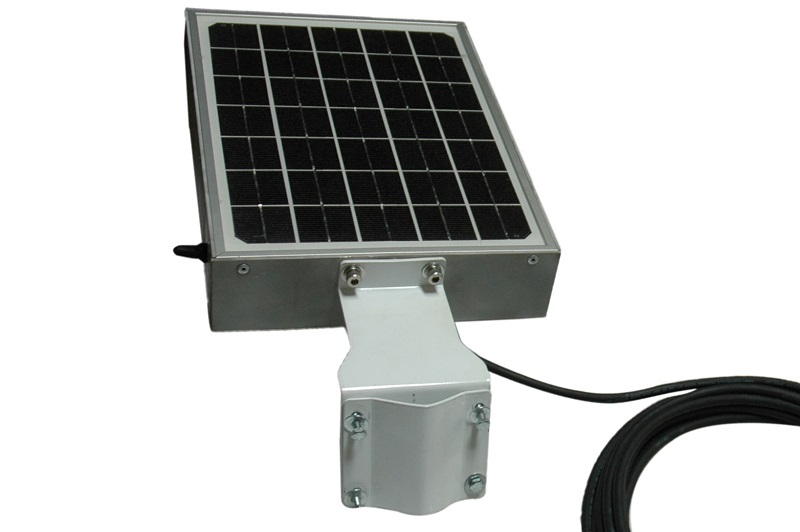 This solar panel is configured to operate non-stop 24/7, day/night with photocell, motion sensor for security purposes, on/off switch for manual operation, or flying leads for operators to connect to user provided external switches. The day/night and motion sensor is programmed to active the solar panel in the evening and to shut it off during the day, activating the LED light when ambient lighting falls below 1 lux. The motion sensor will activate the panel upon detecting movement within range of the panel. The light runs for 12 hours when the battery is fully charged. The sealed lead acid battery pack is contained within the solar panel, not the light. Charging time for the battery is 5 hours when exposed to direct sunlight. As with all solar powered equipment, charging time is affected by the amount of available ambient light. When ambient light levels drop below a certain level, such as on cloudy days, the unit will not recharge. Mounting options include the ability to attach the fixture to flat surfaces such as walls or round/square pole mounting such as on flagpoles or structure supports. The included 3` SOOW cord with Deutsch 2-pin disconnect that runs between the solar panel and the light offers operators convenience and flexibility during the deployment process. The LEDP WRE series LED lights are waterproof to 3 meters, sealed against intrusion by dust and dirt and very ruggedly constructed to withstand the most demanding environments, conditions and applications. An integral Pulse Width Modulation controller, small profile, low power requirements, high durability and versatile mounting makes these LED lights ideal for a wide array of applications including but not limited to: military, industrial manufacturing, machine visioning, security and law enforcement, boating, off-roading and commercial structure illumination. Durability: As well as unparalleled heat control, the LEDP WRE series of LED lights from Larson Electronics also offer IP68 rated construction that is designed to withstand extremes of environmental and operating conditions. These units can withstand rapid temperature changes of -40° Celsius to +85° Celsius, are waterproof to three meters and resist ingress of dust, dirt and humidity. The housings are formed from extruded aluminum and the lenses are unbreakable polycarbonate. The CREE XLamp XM-L® LEDs offer resistance to shocks and vibrations and are rated at 70% lumen maintenance after 50,000 hours of use. The quadpod mount is powder coated for corrosion resistance and durability. Mounting: The SPLED-QP-1X10WRE is mounted on an aluminum quadpod mount that allows for simple and easy movement around temporary work areas and easy deployment, transportation and storage. The quadpod mount on this solar powered LED light is powder coated which allows it to resist corrosion and increases the durability of the mount. A glossy blue powder coat color lends to the aesthetics of the unit. Suggested uses for this light include temporary commercial and industrial applications as well as consumer based remote use and temporary deployment. This light is ideal for boat docks, remote locations that rely on batteries for power, outdoor project lighting, hunting cabins, parking areas, sign or entryway illumination, driveway lighting and anywhere a standalone lighting solution is needed. 1. 100% solar - No external power required. 2. 30 watt solar panel charges one 8aH sealed lead acid battery. 3. Fixture housing constructed of extruded corrosion resistant copper free aluminum. 4. Polycarbonate lens provides high durability. 5. Battery can be fully charged in 5 hours in direct sunlight. 6. Fully charged battery provides 12 hours of runtime. 7. Produces 860 lumens while drawing only 10 watts. 8. 70% lumen retention at 50,000 hours. 9. Portable quadpod mount for easy movement and deployment.